Barcelona Wine Bar is one our favorite restaurants. They have wonderful tapas, and they released a great cookbook last year. Click here for some of the recipes I've tried. The other night we added their fennel salad to the parade of tapas at our table. I had never had fennel salad, but this brightly flavored salad with nutty Manchego cheese and crunchy sunflower seeds won me over from the first bite. I love it! The next day, I ran to the grocery store and bought some fennel, red onion, sunflower seeds, and Manchego cheese. A mandoline made quick work of shaving the fennel and red onion, and a quick marinade in a white wine vinaigrette and topping of cheese and sunflower seeds brought this salad to our table in no time. If you've never had shaved fennel salad, I recommend that you try this salad. It's also great on top of a green salad. I love fennel salad - but have always had it with oranges - I love this combination. I must get this book soon Ninette - all the recipes you've done look amazing! 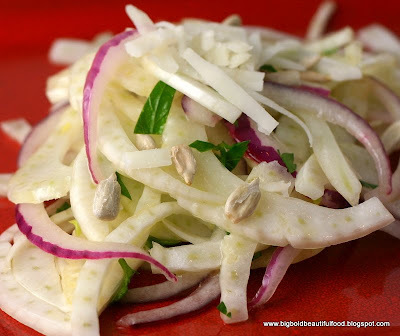 We love fennel salads..I have never paired mine with cheese..this sounds delish..Thank you. I love Fennel Salad too and thank goodness, I just bought some for Sunday's Dinner. Must check for the rest of the ingredients, wish me luck!!! Simple and delicious looking. This is why you're on my blogroll! Good luck with the hip. Love how simple this is. It took me a while to start liking fennel, but now I can't get enough.